Download Free Open Source Game Editor. Game Editor file size: 28 MB. Game Maker for Mobile and PC : Game Editor is a free cross platform game design software that allows you design and develop 2D games for Windows, Mac OS, Linux, iPhone, iPad, Android. Game Editor is open source game design software that gives you the power to create your dream game using its easily to use graphical game designing interface. You can create your games in a quite intuitive way. 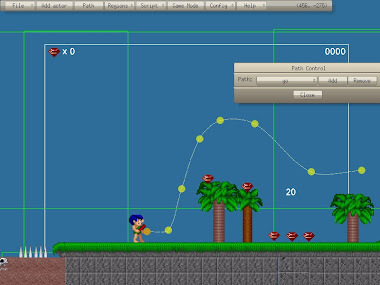 Game Editor gives you a large game designing canvas, a work area where the game objects are manipulated in a visual way. Simply, place on the canvas the objects that compose your game. On this canvas you can see all your game and have a good notion of the positioning of the objects. The objects in Game Editor are known as actors. Notably, this doesn't mean every actor has to be a character. You can add multiple graphics and animations to an actor using supported image, audio and music file formats. The Game Editor engine is Event and Action driven. 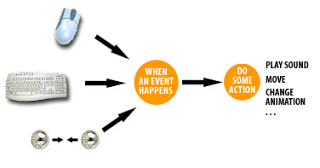 An Event is something that happens during the game and an Action is what should happen in response to an event. Game Editor handles events and actions you create using the interaction of actors, and other game elements, the mouse and the keyboard. As for example, when the user presses a key, or clicks with the mouse, or when an actor collides with another. Game Editor has a set of predefined actions and any events can fire one or more actions including physical response such as collisions. In Game Editor, to program something to happen in your game, you can customize to a very high extent what actions happen on an event. Game Editor also allows you to create Paths, and activation events. Paths are marked as nodes in Game Editor interface, and can specify a route the actor will move on. The speed of the path can also be modified, and the path can be made up of Bezier curves and linear lines too. Drawing a path for your actors is easy with this game creation software. You decide who's moving, where they're going. With Game Editor you can gradually learn a lot about game creation, programming and game designing. With little programming and technical knowledge you will be able to create your own action, adventure, point and shoot or any other type of game using you imagination. Game Editor gives you the chance to get the source code of the game creator and develop 2D games for personal computers as well as mobile devices like iPhone. Game Editor uses a scripting language that bears similarities to the C programming language. Scripts are created through the script editor, defined as an action triggered by an event. The script editor window gives access to the built-in names of objects (actors), variables and functions. It is capable of syntax coloring to make code easier to distinguish. Game Editor is designed to develop games portable across all popular platforms, including Windows (95, 98, Me, NT, 2000, 2003, XP, Vista, 7), Linux, Pocket PC, Handheld PC, GP2X, Windows Mobile-based Smartphones, Mac OS X, iPhone, iPad, and Android.